My bad. | carpe diem! busiest time of year. Starting in mid-December, a goodly proportion of the people whose funding proposals were accepted last spring started to realise that they haven’t spent it yet. And if they don’t submit invoices with a ‘what we did with your money’ report, they’ll lose the funding and their reputations will suffer. No gold stars for them. So I get email messages and phone calls pleading with me to stretch my time like a rubber band to add just one more thing to be done, invoiced and in place by the end of March. What it is to be popular. It’s made more difficult because most of my long-term clients have become my friends, so I can’t let them down. I just… can’t. So gold stars in lieu of spare time for me. Knitting has become a bit, um, the word is probably ‘frenzied’. I think I’m working my stress into stitches, which is doing my arm muscles no good at all: my forearms ache with tension, and the combination of keyboarding and knitting leaves me feeling like a praying mantis as I try to unfold my elbows. Fortunately for my husband the resemblance ends there. Frantic knitting. Let’s see. Those mittens for my sister are now on her hands, together with the IMMENSE mittens required to fit my brother-in-law’s hands. That’s my hand for scale. Apparently he’s thrilled: they’re the first pair of mittens he’s had that fit his adult hands. 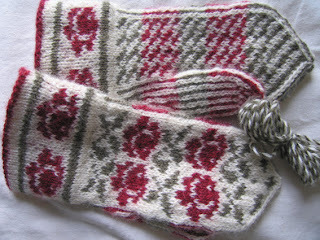 I cannot recommend Leena‘s mitten kits too highly. The designs are pretty, the Finn wool is soft, sheepy and wonderful, and the natural dyes are beautiful beyond words. And she’s incredibly helpful, too. When I said J’s hands were immense she promised I wouldn’t run out of yarn – and I didn’t. In fact from these two pairs (and a third I haven’t started yet because I’ve gone off mittens for the moment) I’ll probably have enough lovely wool left to make a pair of fingerless gloves for me. Not much dark brown left, though. Note that the red dye hasn’t run/stained the white, it’s just a halo of soft red wool fibre and my poor photography. What else? Spinning, of course. I present to you another small step up the steep hill that is my perception of navajo plying. Such honesty. OK, I’ve used a GOOD strand on the penny, but you can see the others where my need to breathe over-rode my ability to coordinate hands and feet. I wonder if I can add twist as I knit those bits? But still I regard this as a triumph. It’s soft, people. Not wiry at all. And that’s 273 metres! I’ve got at least another 7-800m at this rate. What will I do with it? I’ve discovered my default answer is ‘shawl/scarf’, which bothers me a bit. On the other hand a friend needs a comfort shawl right now, and if I had a stock I’d have one to give her so I wouldn’t have to agonise about how to find the time to knit one. Unfortunately neither of my two would be right. That’s the first repeat plus a bit of the Faux Russian Shawl from Folk Shawls, in Posh Yarn Eva 2-ply. It’s a cashmere/silk blend that’s as soft as soft can be, in a dusty blue shot with faded green. It’s also the first shawl that has forced me to use a lifeline: for some reason I found the first repeat of this pattern very difficult to work. I don’t mind the odd half-hour spent dropping a stitch or three to make a correction, but I lost two hours re-working about 60 stitches. That’s not entirely the shawl’s fault, of course. I might have been a little foolish to attempt to drink wine and watch TV while knitting. The most useful thing was probably my decision to attack the photocopied pattern with coloured pencils to mark the centre line of the main pattern elements as well as every 10th stitch. I now have markers (see them glinting?) to match the pencil lines, so I know immediately if something’s awry. Although I do have to shift most markers one stitch on every pattern row, this is still faster than ripping back. And I think the end result is worth it, even unblocked. 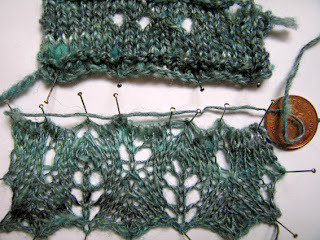 There’s some frantic knitting that I haven’t photographed yet. I desperately want to cast on for another, simpler shawl, but I NEED sweaters. It’s cold here. I can knit sweaters, I am a reasoning, reasonably intelligent adult. I can do this. I just have to start. So I started. I’ve got gauge and have done about 2″ of the sleeves (two at once, magic loop) for Autumn Rose (link chosen at random from the many). Ravelry has proven its use once again: someone roughly my bust size has confirmed that the 37″ will fit nicely with an inch of negative ease. So, be bold, be bold… but not too bold. I must check my gauge regularly! And more spinning, on the spindle this time. Top, Andean 2-ply; bottom, the singles. 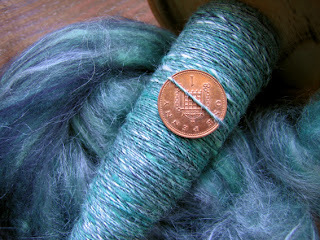 This is most of one of four Mermaid batts from Squoosh. Two or three blue/green wools carded with white silk, the exact colours of a small bay with a white shell-sand beach on the west coast of Scotland… and in my memory. I am trying to spin a soft singles that is consistently thicker than the thin one my hands want to make, which is difficult. I read recently that once you’ve got the hang of spinning it’s easier to spin thin than thick, and I believe it. Periodically there’s a little lump of wool that won’t draft and passes into the singles to become a textured heathery lump in the yarn, easily seen in the 2-ply sample. Question is, what am I going to do with this? ‘Soft’ is successful: this is a lovely squozeable yarn, far too soft for socks (my first thought). The heathery 2-ply would be a good sweater fabric, but there won’t be enough for that. It’s 4.75 oz of fibre. 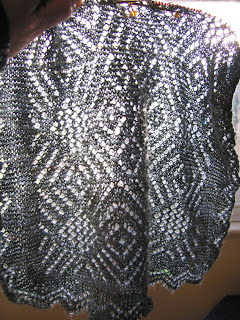 I could knit a comfort shawl with it, something like the Wool Peddler’s Shawl would work well. I could save it to combine with something else. I think (what do you think?) I’d be justified in using the singles for lace; the lumps just seem to add character if I use a relatively simple textured stitch such as fir cone. Gah. I’m astonished at how annoyed and frustrated I am, just because I don’t know what to do with this pretty yarn. That’s not what spinning is for! Other frantic things you can’t see because I won’t show them. nyah, nyah. Such as the pile of stuff to be thrown away. I find that when I am truly stressed I still procrastinate, but in ways that reveal the depths of my desperation. I clear shelves, I throw masses of stuff away, hoping perhaps to find some spare time at the bottom of that box of archive images cut from magazines in the days before the internet put entire image libraries at my fingertips. I acknowledge I’m never going to have more than a passing interest in calligraphy, so those photocopied samples of fabulous handwriting can be recycled. My notes for the ‘Become Addicted to Landscape History through Hedgerow Dating‘ courses I taught 10 years ago are surplus to requirements: the space is needed for my fibre stash. I haven’t found a cache of spare time (why didn’t I put some aside when I was 11 and bored during the endless hot summer holiday?) but I do feel a little lighter and more cheerful as I acknowledge that there are many things I once did that no longer interest me, and others I planned to do that are unlikely to be as absorbing as the many challenges and friends I’ve found in fibre. This entry was posted in Uncategorized on January 29, 2008 by sarahw. The lorry was on the A1M -on the flatlands of the Vale of York!!!! It was quite windy ‘On the Hill’! You may not have posted very often lately but you do provide a good read! Sorry, Sarah. I’m a worry-wort, I suppose…I must say that your “frantic” knitting looks terrific! I could only hope to do so well. Thanks for popping in to update us. Best of luck on the client projects! Your Faux Russian Shawl is going to be gorgeous! I missed your posts!! Wow. Great mittens. I’ve been dreaming of something like that all winter. As for the sweater–It’s not like you chose any restful stockinette cardi or anything there! Autumn Rose, Whoa, a little complexity, huh? I love all the progress! So beautiful. Here are my thoughts: 4.75 ozs=scarf or mittens? Slubs and fat spinning…wonderful, imho. Slubs make it handspun, feel relaxed. Slub away. If you want perfect? buy machine made yarn! Fat singles. Use a lower ratio(put driveband on bigger whorl) make the tension pull in quickly, and don’t draft much. 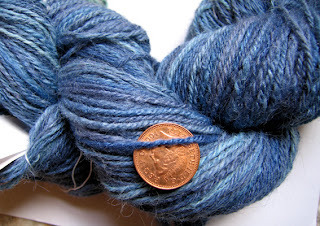 Let the fiber fly into yarn on your bobbin, and you’ll have thicker singles. It’s my favorite thing to spin. Good visiting with you, friend! Glad to hear you are OK. Life does get in the way sometimes doesn’t it? I saw the mittens on Ravelry and think they’re just lovely. I must admit I don’t think I’ve got the patience for a pair like that at the moment, I’ll just look at yours instead! a lot of knitting news! sounds great. I just got Leena’s mitten kit and I can’t wait to try it. it’ll have to wait a bit- but looks lovely. yours are stunning. 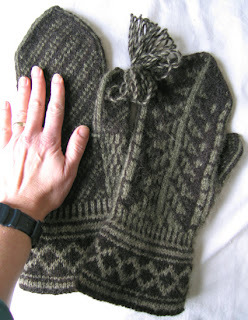 All gorgeous stuff – as a new mitten knitter and spinner your work is a great inspiration! Hey there, friend! How are you? If you’d like a gentle nudge back into blogging, I’ve posted a meme on my blog. I’d love to hear from you and it’s an easy one to do! As the reluctant custodian of mantis-arms (actually, I came out of holiday knitting more closely resembling a grub with mantis-arms) I pass on what’s been a life-saver for me. In a yoga class the teacher had us get on all fours and then turn our arms so the thumbs pointed to the outside and our fingers pointed to our knees. My right hand felt so different from my left as to be diagnostic. (Leaning forward or back changes the pressure; you can also do it crosslegged — or not. I couldn’t, the last time I tried.) Whatever it takes to save our hands.